Explore some nice deals in the Walmart Ad kitchen appliances range. Make your best coffee with the Keurig K-Compact brewer. Red and Black colors are available. Buy it only for $59. It's available only at Walmart. Replace your servingware with the Better Homes Gardens porcelain products. New products like chip & dip dish are on pg 9. 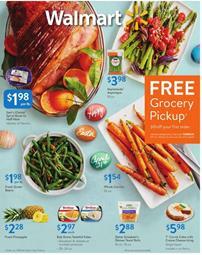 This Walmart Ad also offers a range of household supplies. Buy laundry chemicals at Walmart at lower prices. Tide liquid laundry detergent or PODS costs only $11.97 at Walmart stores. Besides, you can find paper plates, cutlery, party cups, and more. Renew the stocks of pet supplies including dog and cat foods. Dog treats, health bars, canned foods for dogs, and more are in stocks of the store. Blue Buffalo Co. pet supplies became popular. You can track the news about the deals from the future Walmart Ads. Follow our Facebook page, subscribe or allow your browse to send notifications about the ads and deals.